Attendees put their heads together in a breakout group at the DFMCH’s opportunities conference. More photos. 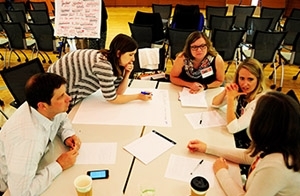 The UW Department of Family Medicine and Community Health (DFMCH) continued its strategic planning initiative this spring with Blue Sky presentations from Walnut Way Conservation Corporation co-founder and director Sharon Adams and futurist Rebecca Ryan, plus an interactive opportunities conference at the Wisconsin Institute for Discovery. The events built on the DFMCH’s first Blue Sky conference held in March. In an energizing discussion (view full summary and video), Walnut Way’s Sharon Adams, praised the DFMCH for its commitment and efforts to improve community health. Expect to expend lots of energy to engage colleagues in a change process. Give voice to as many perspectives as possible. Develop a vision and pathways where resources are attractive for implementation. Nurture authentic relationships that give people the opportunity to come to community. Put learners and faculty in communities, and hold yourselves accountable to the outcomes. Futurist Rebecca Ryan (http://nextgenerationconsulting.com/) led off her presentation with a simple goal: not to predict the DFMCH’s future, but to show us how futurists think. Foresight, she explained, asks us to put our minds 20 years into the future, ask “what’s plausible?” and then determine how to prepare for that future. She then discussed four key forces that will influence the future—resources, technology, demographics and governance—and how they may impact health care. Other forces include changing family structures, the shrinking middle class and pressure to reduce health care costs and increase patient (and practitioner) satisfaction. In light of those forces, strategic foresight comes not from asking how to do our current work differently, but asking why we do it in the first place – and creating our future from there. Approximately 65 DFMCH faculty and staff met in early June for a day-long opportunities conference designed to strengthen the foundation of the department’s emerging strategic plan. Mercedes Alonso from The Napier Group facilitated small-group sessions in which participants generated concrete solutions for organizational challenges. Alonso also shared common themes that emerged from earlier surveys, including wellness and resiliency, teamwork, and recognition; participants voted on which themes were most important, and identified ways to address them in a future action plan.